Jonathan Moreno interviews Cody Unser, a youth advocate for science-based healthcare policy with an inspiring story. Why what you think you know about agricultural biotechnology may be wrong. The misguided human embryonic stem cell research ruling by a U.S. court would discontinue amazing gains made over the past 12 years in regenerative medicine. The Food and Drug Administration approves the first clinical trial for embryonic stem cell treatment in patients with recent spinal cord injuries—creating a much needed regulatory pathway. Crops yields must improve to feed a hungry planet amid global warming, but that will require more ecology-based farming and less biotechnology. Can Agricultural Biotechnology Help the Poor? Biotechnology can help the poor, but whether it will depends on people of good will taking the time to understand and consider the arguments in some detail. The Pittsburgh Life Sciences Greenhouse was formed in 2000 as a focused incubator to provide capital investments and customized company formation. A focused incubator provides deep knowledge of global industry trends, national networks, and corporate collaborations to identify investment opportunities. Refusing to pursue recent and possible future developments in medical research is itself a morally momentous decision—and that inaction has consequences Cohen and other right-wing thinkers refuse to acknowledge. Americans know that the future fortunes of the country rest on scientific and technological advances, so Mr. President, let’s take biomedical science policy seriously. Recent reports indicate that Europeans seem to be moving towards acceptance of genetically modified foods, as long as they are properly labeled. Conflict surrounds discussions on GM crops, but there are many facets of the debate over these seeds. In a briefing yesterday for Capitol Hill staffers, neuroscientist Martha Farah explained that new technologies that enhance the power of the brain also raise questions about safety, economic fairness, privacy, and personal freedom. Two stories this week describe two different approaches to plant genetic resources. Tuesday, researchers from Washington University and Iowa State university announced a completed draft of the corn genome. The same day, the Svalbard Global Seed Vault, which will store seeds from around the world in the event of catastrophic loss, opened on a remote Norwegian island. The U.S. government has poured money into this experimental new vaccine alongside private investors. The effort just might carry the vaccine all the way to the marketplace. AAAS president critiques U.S. science and tech policy; researchers map human impacts on ocean ecosystems; new materials for carbon capture; harnessing the tides and waves for energy; biodefense watchdog shuts down. The National Research Council of the National Academies convened a symposium Wednesday to explore approaches among “Future Directions in Research at the Intersection of the Physical and Life Sciences.” The intersections up for discussion ranged across the research spectrum: from synthetic biology to geoengineering to bioterrorism. NASA has a new face on the web; the NIH says gene therapy wasn’t the cause of death in a recent trial; open-source standards and net neutrality can improve global health; and more. Researchers working independently in Japan and the U.S. published papers this week announcing the creation of non-embryonic pluripotent stem cells. The method side-steps the ethical concerns over the destruction of embryos and could open the doors for federal funding of research on stem cells and the medical breakthroughs they promise. President Bush vetoed the Labor-HHS-Education appropriations bill, which would have increased funding for the National Institutes of Health from $29 billion to $30 billion and required open access to published NIH-funded research. President Bush vetoed the Labor-HHS-Education appropriations bill, which would have increased funding for the National Institutes of Health from $29 billion to $30 billion. The legislation would also open new doors for access to scientific research open-access scientific publishing, as it "included a provision requiring NIH-funded researchers to post the full text of their research papers on the National Library of Medicine's publicly accessible PubMed Central website within a year of publication." Production of the One Laptop Per Child computers began in China this week. The first machines will ship to students in Uruguay, Peru, and Mongolia. Reward drug development with cash prizes, not patents. A proposal for the federal government to lower drug costs by offering prizes for medical research. 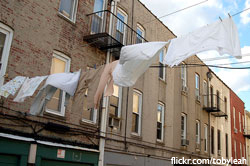 Sixty million Americans live in places where laundry clotheslines are banned, but activists concerned about saving energy by avoiding electric dryers are fighting for their "right to dry" (NPR audio). Google hit a bump in the road on its quest to acquire online advertising company DoubleClick: the European Commission did not approve the deal on account of antitrust concerns and has ordered a review. In the U.S., the Federal Trade Commission is still reviewing the aquisition. Nobel Laureate Al Gore is now a partner at Kleiner Perkins Caufield & Byers, one of the largest and most well-known venture capital firms in Silicon Valley, where he will focus on researching investments in alternative energy start-ups.